The Motorhome for all the family. With beds available above the drivers seats, a convertable bedding area which you can convert after eating and the double bed big enough for 6ft 2" me and my beautiful wife. Where you can watch TV and listen to music, after a very comfortable ride in a motorhome big enough for family or crew to enjoy themselves inside and out in all enviroments, knowing you are safe ,comfortable and secure, having fun wherever you go. 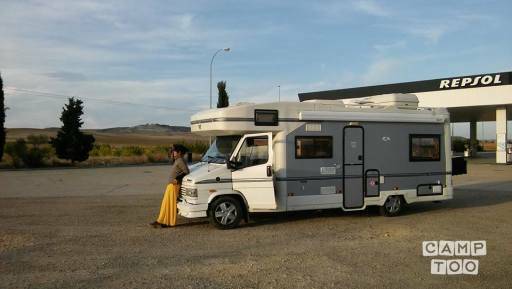 To get the best out of the Motorhome, if travelling long way, drive at average speed 50 -60 mph ( 80 - 100 kmh . Keep if fairly clean and smoke outside as other renters might not like it.